In 2005, we spun our online scheduling system off into a new company called Aladtec Incorporated. Since then many new features have been added along with many thousand lines of new programming code. Ever since we built our first online employee scheduling system back in 2002, we've been amazed by the dedication and the sacrifices made by the employees within the public safety industry. We're thankful for everything they've done to help us spread the word about our product and our company. It's an honor for us to be involved with the good people of such a noble profession. We now offer an online employee scheduling and workforce management system that is suitable for both small volunteer services and large multi-location corporations. Aladtec provides an efficient, and cost-effective, solution to effectively manage employee scheduling and personnel data for many industries. We are proud to have been ranked on the prestigious Inc. 5000 list of the fastest growing private companies in the nation for three years in a row. This year we moved up three spots to #2897. Only one in five businesses on the list achieve the accolade of appearing on the list three times. Now, with over 2,100 customers and more than 134,000 active users using our employee scheduling and workforce management system, we are excited for what lies ahead and are committed to continuing to make our customer's lives even easier. BAYCOM is the Midwest’s leading provider of voice, video and data solutions. Featured Law Enforcement Solutions: Panasonic Toughbook and Arbitrator, Motorola Solutions, Video Surveillance, Wireless/WIFI solutions, Automatic License Plate Recognition (ALPR), and Next Generation 9-1-1. Installation, sales, and service of Emergency Vehicle equipment. Blauer is a leader in developing and manufacturing high-performance, protective police uniforms, apparel, accessories, police gear, and footwear (including tactical boots) for the public safety market. We believe uniforms and tactical clothing should provide Serious Protection to public safety professionals in three ways: by shielding from the elements, by helping project an image of authority, and by preventing and protecting against on-the-job accidents and threats. Our high visibility jackets, TacVest® tactical vest carrier (part of the uniform-appearance ArmorSkin® system), ANSI-certified reflective vest, and more provide durable performance for years. Use our 80 years of success in making top quality uniforms that meet all three of these needs to outfit your agency for now and the future. Relentless pursuit of the best technology and constant attention to detail is our way of giving back to the people who protect our community every day. For more information, or to shop our police uniform store online visit our website. A LEADING VOICE FOR HIGHWAY SAFETY- Semitrailer trucks play a vital role in the U.S. economy and transportation system, but longer, heavier trucks endanger motorists, weaken our roads and bridges, and cost taxpayers billions of dollars every year in highway subsidies. A leading voice in opposing more dangerous truck configurations, the Coalition Against Bigger Trucks (CABT) is a national, nonprofit grassroots organization that advocates for highway safety and sound transportation policies. Ewald Automotive Group is a family-owned and operated automobile dealer group headquartered in the Delafield, Wisconsin area. Founded in 1964 by Emil Ewald, today the company is owned by brothers Craig, Brian, Dan, and Tom Ewald. Ewald operates seven automobile dealerships, a rental car company, a national fleet leasing company, and an Airstream RV dealership. Your police vehicles are more than just cars and SUVs. They’re an integral part of your officer’s job. Failure is not an option. Above and beyond the mechanical excellence you expect, you also need a trusted partner who can provide and service the vehicles designed to handle some of the most critical situations. The diverse, reliable police and special service vehicles from Chevrolet deliver on all fronts: cutting-edge safety features, impressive cargo capacity and efficient ownership costs. Providing you with the broadest range of work-ready vehicles and outstanding service -- it goes hand in hand with GM Fleet and Commercial’s commitment to great products, innovative business solutions and exceptional customer experience. Your success. It’s how we measure ours. Harley-Davidson® Police Motorcycles are the FLHTP Electra Glide®, the FLHP Road King®, and the XL883L Sportster®. Harley-Davidson Motor Company offers the most complete line of motorcycles for law enforcement, enhancing responsiveness and maneuverability in any situation. Around the world there is no greater symbol of respect and authority than a law enforcement officer on a genuine Harley-Davidson Police motorcycle. The performance, power and reliability they need to perform at their best know no geographic boundaries. It’s not surprising that over 3,700 law enforcement agencies in the United States trust Harley-Davidson® motorcycles to protect the communities they serve. There is something undeniably right about a Cop on a Harley-Davidson. Lexipol provides comprehensive, defensible policies written by legal and public safety professionals. Our legal and experienced public safety team instills complete confidence by constantly monitoring and reviewing government legislation and case decisions. More than 150 policies based on federal and state statutes, case law and law enforcement best practices. availability of LexisNexis eCrash, an automated online vehicle crash report retrieval system that will drive internal efficiencies and improve citizen services for police departments across the state. This new system enables police departments to fully automate their accident report retrieval process resulting in time/cost savings, more effective information sharing between agencies, enhanced investigative capabilities and the ability to offer reports to interested parties via the LexisNexis eCrash web portal. Leveraging the LexisNexis eCrash solution, officers are able direct parties involved in an accident to the eCrash web portal to retrieve their reports, minimizing the fulfillment of report re- quests at the department. LexisNexis eCrash provides agencies with the ability to upload reports to the eCrash system where the reports are indexed and stored electronically. Requests for copies of the accident report can then be made via the Internet instead of in-person at the station, saving significant time for both officers and citizens. Law Enforcement requires real-time information for better situational awareness and more informed decisions in the field and at the command center. Mission critical intelligence gives law enforcement the power to access information, stream video and collaborate in real time. By integrating unparalleled voice communications, immersive data applications and robust security into purpose-built systems, devices and command centers, we help dispatchers and responders work safer and smarter to improve real-time decision-making capabilities. Pace Scheduler is a modern web platform for 24/7 scheduling. Starting with Fire Departments, we designed our application that suited their particular needs in a user-friendly and streamlined way. We've kept learning through our growth and added loads of features to our arsenal by turning our focus on Police. The diversity across our customers has resulted in a very modular approach on our end, with flexibility in customization all along the way. The Police & Sheriffs Press, Inc. (PASP ID) provides secure Holoview® credentials for over 5,000 government agencies worldwide! PSAP ID’s Holoview® card is one of the most secure ID card platforms in the world today because they feature numerous overt and covert embedded security features such as: embedded holograms, demetalized imaging, nano-text, black light core stock and multiple other security features which their cards highly resistant to counterfeiting. To learn more about how PSAP ID can meet your agency’s secure and other credentialing needs: please visit https://pasp365.com/, email [email protected]asp365.com or call 800-707-3080. It is our mission at Ray O'Herron Company to strive for excellence through our products and services. We have two store locations to serve you and we also have traveling sales representatives for departments. You can go to our Salesperson tab to find out which sales rep. services your area. If you are not sure, please call or email us so we can assist you. We have developed a new, simple to use website to help you easily locate the products you are looking for within our large inventory. In addition, to make it even easier to pin point the exact product you are looking for, there is a versatile search bar. With this search bar you can search for a product name, product number, brand, etc. Ray always said that, "If it were not for the customer, we wouldn't have a job.". This is the founding thought and belief of this company. We would like to invite you to shop with us today. We would also love to hear from you if you have questions or comments. S&A also offers online employment application management services (https://www.applytoserve.com/) as well as psychological evaluation services conducted by licensed police psychologists. To learn more about how S&A contact help you with your agency’s testing needs, please email [email protected] or contact them directly at 800-367-6919. 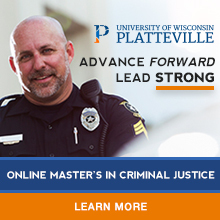 UW-Platteville’s 100% online Master of Science in Criminal Justice (MSCJ) prepares law enforcement leaders to advance their careers and promote best practices. Ranked among U.S. News and World Report’s top 35 Online Graduate Criminal Justice programs for 2019, the MSCJ fits advanced education into your busy schedule. The Criminal Justice Management concentration is ideal for professionals who are working in supervisory and administrative positions or seeking promotion. You can also choose an emphasis in Criminal Justice Theory, Victim and Offender Services, or a customized focus area like organizational management or criminal law. Visit our website to download a free brochure and find out more about how you can take command of your career with a convenient and affordable graduate education. Government agencies face new challenges as the political landscape shifts and contemporary society requires technologies that keep people and systems connected in real time, all the time. The public sector at every level – state, local, federal and global – is under constant pressure on many fronts: The need to cut costs while workloads expand; the need to secure information and infrastructure in a time of uncertainty; the need for remote access and mobility; and the fundamental need to connect with core constituents to provide the basic services that underpin a healthy democracy. The good news is that the technology exists to help government agencies meet today’s challenges and reduce costs at the same time. However, the pace of technological innovation can make it difficult for decision makers to sort through all of the complexity. Verizon provides transformational IP-based products and services to business and government agencies around the globe. We have helped thousands of public sector clients solve their IT, security communications and network challenges and we can provide the expertise and resources to help you develop and implement the right solutions to meet your agency’s specific needs. Vinyl Graphics is a warehouse distributor that offers a professional line of automotive graphics and trim products. Starting in 1985 as a warehouse distributor selling pinstripes to body shops, we have expanded both our product lines and our customer base. We are now one of the largest automotive trim distributors in the United States. Our company is made up of three main divisions; automotive, custom graphics and sign material. The Body Camera Paradigm Shift- Visual Labs takes a completely different approach to body worn cameras versus the many other “camera‑only” products on the market today. The Visual Labs body camera solution represents a paradigm shift in the thinking toward body worn cameras. We believe the appropriate definition of BWC is not Body Worn Camera, but instead Body Worn Computer. We believe that there is no reason for any security agency to acquire a simple, camera-only device when available technology provides the option for so much more functionality, with the potential for significant cost savings. The Visual Labs solution uses a fully-functioning smartphone as the recording device and provides all the features that camera-only devices offer. The key advantage of the Visual Labs system is that all the built-in functionality of the smartphone (a small computer) is also available. This includes the ability to obtain real-time situational awareness via a live stream video feed sent to a command center, which could be fixed or mobile, and could be located anywhere in the world. Further, with appropriate authorization and control, a command center has the ability to remotely initiate a live video stream. This functionality could prove to be critical in cases where communication with an officer cannot be established, whether due to radio equipment failure or, in a worst-case scenario, due to the officer’s inability to respond. Another function of a smartphone that is inherent in the Visual Labs solution is the ability to provide real-time positional awareness via GPS, which represents a significant enhancement to officer safety. A dispatch or command center can know the location of an officer, even when the officer is away from a GPS enabled patrol car -- for example, in a foot pursuit. All this functionality is available without the need to pair the device with any additional hardware. Whelen Engineering designs and manufactures high quality audio and visual warning equipment for Automotive, Aviation, Mass Notification, and Motorsports industries worldwide. Founded in 1952, Whelen has the largest staff of design engineers in the United States and the biggest field service force in the industry. With two state-of-the-art facilities in Chester, Connecticut and Charlestown, New Hampshire, Whelen products are proudly designed, manufactured, and assembled in the U.S.A. Whelen designs, manufactures, and assembles Super-LED® lightbars and lightheads, LED beacons, siren control centers, and speakers for Police, Fire, EMS, and Public Works industries worldwide.